Question: Why is it that that the two types of eternally liberated beings, namely those in the Vaikuntha planets and those in Goloka, have been directly manifested there without undergoing the process of choosing which side they will go? Why are they spared making a choice and we are not? It doesn’t seem fair. Also, what is the necessity of this material world? Answer: In response to your questions, we turn to our acaryas and their words on the subject in addition to our own realisations on this. Srimati Radharani’s servitors are manifested from Herself, whereas other parsadas (associates) in the spiritual world are manifested from Baladeva. All these eternal parsadas in Vaikuntha are already complete in bhakti and full of love for Krsna. Theirs is a special case. However, the jivas originating from the tatastha (marginal plane) with imperfect discrimination do not have the same fortunate position from the beginning – this is the Lords prerogative to create His own associates in the spiritual realm. Their bhakti is eagerness for Krsna’s association and love for Him. They serve Him by associating with Him. 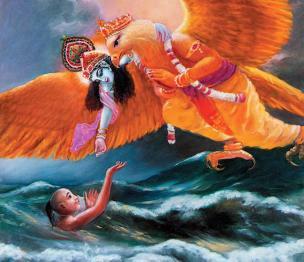 It is the Lord’s desire that He has such nitya-mukta parsadas (eternally liberated associates) to associate with. They are not ordinary jivas like you and I. As shown in the quotes from our acaryas below, they are eternal and since in the spiritual world there is no past, present or future, there is no conception of their creation. Time is a concept only available here in the material world. Are we to question Lord Krsna’s motivation? I think not! This is an important component of bhakti-yoga. Bhagavad-gita 4.34 mentions three qualifications in approaching the guru – pranipat, pariprasna and seva, or surrender, submissive inquiry and service. Submission is imperative. In Visvanatha Cakravarti Thakura’s Gurvastakam prayers, which Srila Prabhupada introduced in all his temples, the first verse states how the guru is like rain extinguishing the forest fire of material existence (samsara davanala lidha lokah tranaya karaunya ghanaghanatvam) – this is the guru’s mercy. Similarly, the last verse states that by the mercy of the guru we attain the mercy of Krsna, but without the guru’s mercy we cannot attain Krsna’s mercy (yasya prasadad bhagavat prasado yasyaprasadan na gathi kuto’pi). The point here is that we are dependent upon mercy, and mercy requires a humble, submissive approach. Prasada means the Lord’s mercy. We are dependent on it and cannot progress at all or even understand philosophy without the His mercy. This means we must be submissive and unchallenging to the Lord and His representatives. We can never attain the Lord’s mercy without submission and humility. This doesn’t imply that we become blind followers, but this is an integral part of the process of advancing in Krsna consciousness. Bhakti, according to Rupa Gosvami in his Bhakti-rasamrta-sindhu, is not only favorable to Krsna, but is pleasing to Krsna (anukulyena krsnanusilanam), and by pleasing His representatives, we please Krsna. Our siksa-guru Srila Sridhara Maharaja states that absolute surrender is required to come to the highest platform of devotion, so we must inquire submissively and not in a challenging way. When one is seriously interested in devotional advancement and has progressed sufficiently to such an extent that we are eager and earnest to please Krsna, then it is essential to accept our acarya’s words and instructions as non-different from the words of the Supreme. Ergo, we must accept their words as conclusive with the understanding that it is Krsna’s will that it is as it is. Krsna is the King of all rasas (akhila-rasamrta-murti) and the Supreme Enjoyer, therefore He should not be questioned or criticised simply because we feel neglected or unfairly treated. Lest we forget, He is the enjoyer – not us! We have to earn our position in Vaikuntha by a life or even lifetimes of devotion, purifying ourselves through volumes of service. As we progress, we become more and more absorbed and ecstatic. The process is susukham kartam avyayam – joyful and everlastingly performed. Mercy also means that it is not always bestowed upon us – sometimes we may be passed over. An advanced devotee however, will also accept this as the Lord’s mercy, or sometimes even as a test. All our acaryas proclaim this throughout their writings. You have asked what is the necessity of the material world? Our philosophy is that this world is created by Krsna for the jiva-sakti (living entities). We are given free will to do as we wish, right or wrong, and our wrongs cause our suffering. This suffering is our own fault – not Krsna’s. Other religions (ie. Christianity) cannot explain why a newborn child may suffer, but we can understand it is the child's karma from its past. Constitutionally, we are all servants or Krsna, but with our imperfect discrimination, we chose to come here and now it is up to us to try to understand our true nature and duty. The Lord helps us by sending the scriptures, the sadhus, the guru and even sometimes manifesting Himself. He also helps us internally as the Supersoul. Because of our free will, we have a choice to not love the Supreme, so when we develop bhakti and come to truly love Krsna, then our love means a lot to Him. You think that you deserve to be originally in the spiritual world, but why not all the living entities? Why not? Because that is not Krsna’s desire. His arrangement is that some are there as His eternal associates and some are here to hopefully develop their bhakti and qualify to enter the spiritual realm. That is His will, so we must accept it. Our acaryas recommend that we not worry about why we are here, but rather ask how we get out of here, i.e., by qualifying ourselves to attain the spiritual realm. That is the mercy we have received. Sudhira Gosvami - Bhaktivinoda Thakura in Jaiva Dharma says that the jivas are emanating from the effulgence of Baladeva, right? Raghunatha Dasa Babaji: Cit-sakti is Krsna's full and absolute spiritual energy. Anything she creates is eternally perfect. Jiva is not an eternally perfected (nitya-siddha) being; through sadhana (the process of practical devotional service) he becomes perfected (sadhana siddha) and experiences the same level of spiritual bliss as a nitya-siddha. The four classes of saktis of Srimati Radhika are Her nitya-siddha associates and are Her kaya-vyuha expansions, while Radhika is cit-sakti Herself (cit-sakti-svarupa). The jivas are produced by Krsna's jiva-sakti, or marginal potency. Cit-sakti is Krsna full and complete potency (purna-sakti), whereas jiva-sakti is Krsna incomplete and partial energy (apurna-sakti). All full and absolute principles are transformations of the purna-sakti, and the infinitesimal spiritual having entities are the transformation of the apurna-sakti. Lord Krsna expands Himself taking up forms appropriate for presiding over the different manifestations of His sakti. In the cit-sakti manifestation Lord Krsna presides over in His original form as Krsna and as Narayana, the Lord of Vaikuntha. When presiding over jiva-sakti He expands as Lord Balarama, His vilasa-murti (expansion who assists Krsna is His pastimes). In maya-sakti He accepts the triplicate Visnu expansions of Karanodakasayi, Ksirodakasayi and Garbhodakasayi. As Krsna, in Vraja, He brings into existence everything that is fully and wholly spiritual. As Balarama, He accepts the form of Ananta-sesa and generates the eight varieties of servitors, the eternally liberated associates of the supreme Lord Krsna (nitya-parsada), to execute the eight types of devotional service to Krsna. While in Vaikuntha, Lord Balarama expands as Sankarsana (Sesa) to generate eight varieties of nitya-parsadas of Lord Narayana to accomplish the eight kinds of service to Him. Lord Sankarsana further incarnates as Maha-Visnu to preside over maya-sakti, then accepts the form of Paramatma and generates the conditioned jivas, who are inclined towards maya. As long as the conditioned souls do not receive the shelter of the Lord's internal spiritual potency, hladini-sakti, by His mercy alone, they are always prone to be subjugated by maya. In maya's captivity they are obedient to the dictates of the three modes of material nature (triguna). Hence the conclusion is that jiva-sakti gives birth jiva – cit-sakti does not produce the jivas. Vrajanatha: I heard you say earlier that the spiritual world as well as the jivas are eternal; how is it possible for eternal entities to have birth, appearance or creation? If at a certain time they appear because they were non-existent before it, how does that confer eternality upon them? Raghunatha Dasa Babaji: Time and space as you experience in this material world is quite apart from time and space in the spiritual world. Material time is divided into three sections – past, present and future; but in the spiritual world time is an unfragmented continuum – it is perennially present there. All spiritual activities, and happenings in the transcendental realm are perceived in the present (vartamana) time. Whatever incident we describe is laced with, and rooted in mundane place and time factor. Therefore, when we discuss spiritual subjects and say things like – jiva became later entangled in maya; the spiritual world was created; only cit-sakti plays the protagonist in jivas creation and not maya and so on, our words are influenced by material time concept. Such conditioning in our captive status is very natural and inevitable. All discussions on jiva and transcendence cannot be divorced from mundane time concept and hence we must talk in terms of past, present and future. When you are trying to understand the purport of this topic keep in mind that a person who is solely searching the pure essence will perceive and apply the concept of eternal continuous present time factor. Dear young man, you must be extremely cautious on this subject reject the unavoidable mundaneness of it and simply assimilate the spiritual thought.